You think it'd be easy... this roasting a chicken thing. I've done it about 7 times before, each being a very different experience. By nature, I'm a recipe-combiner. That is, I'll search and search until finding the perfect three and then make a joint venture of them all. For the most part, it works. However, there are times where my recipe combination is not such a hot idea. Such as last week's chocolate braised short ribs... do note instagram followers... you did NOT see an after photo of that one. Tonight - I am keeping it simple. 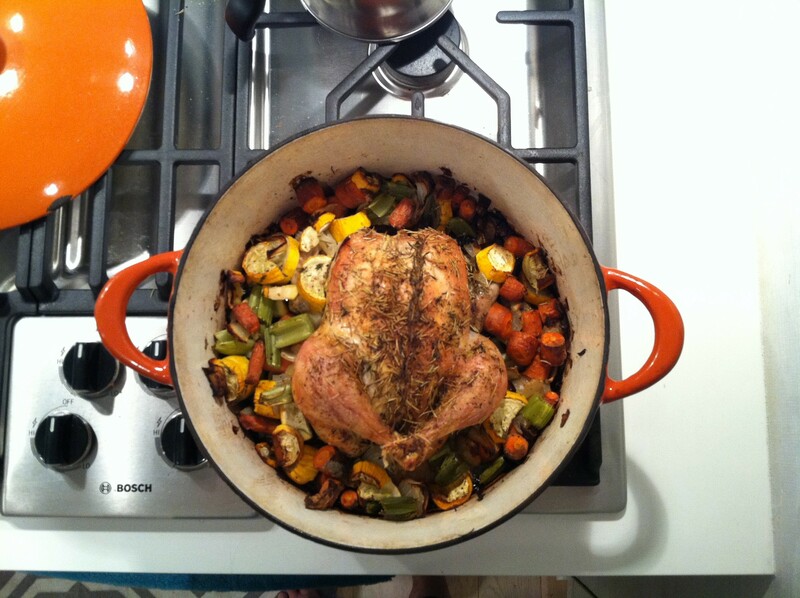 I'm combining two recipes, Thomas Keller's Roasted Chicken & Ina Garten's Perfect Roasted Chicken. I threw in the veggies we had in the refrigerator (onion, yellow squash, carrots, celery). Will update on the status in about 2ish hours. UPDATE - 9:44pm - The chicken recipe mashup was delicious. The skin was super crispy and perfectly salty. Honestly, I was grappling with whether to add the butter pads for the last 15 minutes at a higher temp. I'm glad I didn't... and agree with Thomas (we are on a first name basis now, you know). The butter creates steam which will make our crispy creation less crispy. Tell your guests they can butter their bird when it hits the plate!